Jon Nadler, Kitco Metals Inc. In The Lead – How Sweet Is IT? In The Lead – QE = Questionable Easing? In The Lead – Fed to the Weimar Club: Honey, I Shrunk The Balance Sheet! Precious metals opened lower for the midweek session this morning as market participants held back from making major commitments at or near six-month highs in gold ahead of the ECB meeting tomorrow. Friday’s spot metals dealings opened to the downside amid mild profit-taking and amid incipient signs that pre-weekend book-squaring was underway. Precious metals headed a bit lower early this morning while noble metals headed in the opposite direction and built on yesterday’s hefty gains. 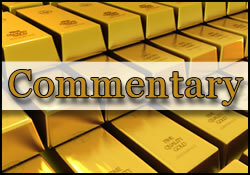 The metals markets opened to the downside for the midweek session this morning. A 0.28% advance in the US dollar and a 0.36% slip in crude oil contributed to early selling pressure. In the Lead – QE Or Not QE – That Is The Question. Or, Is It?